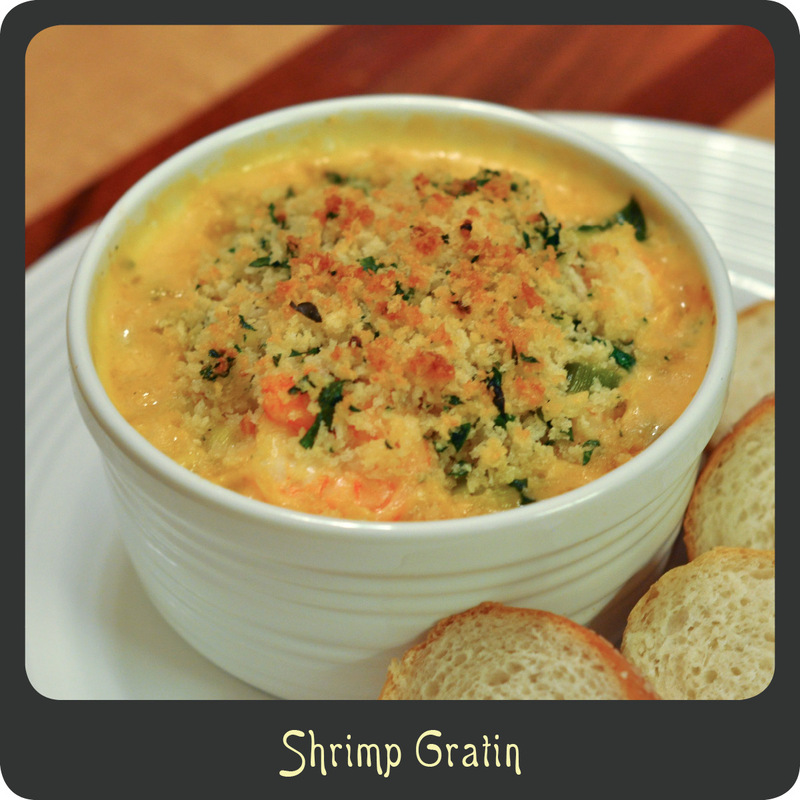 This recipe actually originated as a seafood gratin recipe, however I’m not a huge fan of lots of mystery fish thrown together so I adapted the recipe to suit my taste, and shrimp are my taste. This sauce ends up being creamy and rich and goes great with the shrimp and seasoned panko topping. This really is decadent enough to be served for a special occasion but also quick and easy enough for any night of the week. If you are scrambling to figure out what to do for Valentine’s Day dinner give this fabulous recipe a shot. Your sweetie won’t be disappointed, especially since you won’t have to spend the whole night in the kitchen. Throw together some greens for a salad and a French baguette to soak up the sauce and you have a romantic dinner in less than 40 minutes. Note: This recipe is perfect for entertaining because all the prep and assembly (minus the panko topping) can be done well in advance to save time when your guests are over. Just make the recipe earlier in the day, put it in the baking dish or ramekins, cover with plastic wrap, and store in the fridge until ready to bake. Remove the dish(es) from the fridge a few minutes before placing in the oven, sprinkle with the panko topping and bake for 20 or so minutes. Combine the clam juice, cream, wine, and tomato sauce in a large pot and bring to a boil over medium high heat. Simmer until the sauce is reduced by almost half, about 12–14 minutes. While the sauce is simmering, in a medium sauté pan melt 5 tablespoons of the butter over medium-high heat. Add the leeks and carrots and cook for 5 minutes or until tender. Season the veggies with salt and pepper and stir in the flour and heat for 1 minute. Place the shrimp into the pot of sauce and cook for 2–3 minutes. Add the cooked veggies to the pot with the sauce and shrimp and stir to combine. Remove from heat and set aside. In a small bowl combine the panko, Parmesan, parsley, and garlic. Melt the remaining tablespoon of butter and drizzle it over the crumbs. Toss with a fork to combine. Transfer the saucy shrimp to one large baking dish or 4 individual ramekins. Sprinkle the panko mixture evenly over the top of the shrimp. Bake for 20 minutes or until the top is lightly browned and the sauce is bubbly.